Putting a hole in the center of the donut—a mid-nineteenth-century invention—allows the deep-fried pastry to cook evenly, inside and out. As it turns out, the hole in the center of the donut also holds answers for a type of more efficient and reliable quantum information teleportation, a critical goal for quantum information science. Quantum teleportation is a method of communicating information from one location to another without moving the physical matter to which the information is attached. 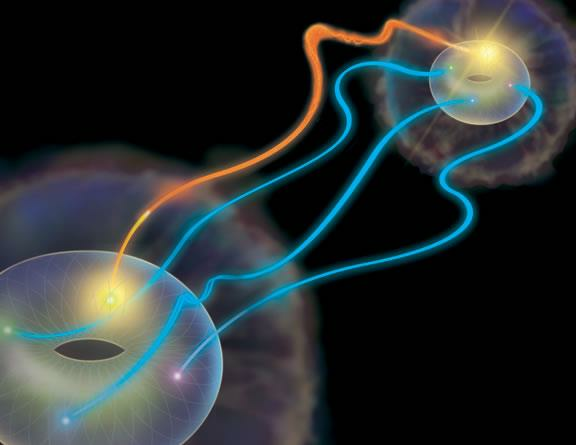 Instead, the sender (Alice) and the receiver (Bob) share a pair of entangled elementary particles—in this experiment, photons, the smallest units of light—that transmit information through their shared quantum state. In simplified terms, Alice encodes information in the form of the quantum state of her photon. She then sends a key to Bob over traditional communication channels, indicating what operation he must perform on his photon to prepare the same quantum state, thus teleporting the information. Now, by taking advantage of the mathematical properties intrinsic to the shape of a donut—or torus, in mathematical terminology—a research team led by physicist Paul Kwiat of the University of Illinois at Urbana-Champaign has made great strides by realizing “superdense teleportation”. This new protocol, developed by coauthor physicist Herbert Bernstein of Hampshire College in Amherst, MA, effectively reduces the resources and effort required to teleport quantum information, while at the same time improving the reliability of the information transfer. In superdense teleportation of quantum information, Alice (near) selects a particular set of states to send to Bob (far), using the hyperentangled pair of photons they share. The possible states Alice may send are represented as the points on a donut shape, here artistically depicted in sharp relief from the cloudy silhouette of general quantum state that surrounds them. To transmit a state, Alice makes a measurement on her half of the entangled state, which has four possible outcomes shown by red, green, blue, and yellow points. She then communicates the outcome of her measurement (in this case, yellow, represented by the orange streak connecting the two donuts) to Bob using a classical information channel. Bob then can make a corrective rotation on his state to recover the state that Alice sent. With this new protocol, the researchers have experimentally achieved 88 percent transmission fidelity, twice the classical upper limit of 44 percent. The protocol uses pairs of photons that are “hyperentangled”—simultaneously entangled in more than one state variable, in this case in polarization and in orbital angular momentum—with a restricted number of possible states in each variable. In this way, each photon can carry more information than in earlier quantum teleportation experiments. At the same time, this method makes Alice’s measurements and Bob’s transformations far more efficient than their corresponding operations in quantum teleportation: the number of possible operations being sent to Bob as the key has been reduced, hence the term “superdense”. Kwiat explains, “In classical computing, a unit of information, called a bit, can have only one of two possible values—it’s either a zero or a one. A quantum bit, or qubit, can simultaneously hold many values, arbitrary superpositions of 0 and 1 at the same time, which makes faster, more powerful computing systems possible. This research team is part of a broader collaboration that is working toward realizing quantum communication from a space platform, such as the International Space Station, to an optical telescope on Earth. The collaboration—Kwiat, Graham, Bernstein, physicist Jungsang Kim of Duke University in Durham, NC, and scientist Hamid Javadi of NASA’s Jet Propulsion Laboratory in Pasadena, CA—recently received funding from NASA Headquarter's Space Communication and Navigation program (with project directors Badri Younes and Barry Geldzahler) to explore the possibility. The team’s recent experimental findings are published in the May 28, 2015 issue of Nature Communications, and represent the collaborative effort Kwiat, Graham, and Bernstein, as well as physicist Tzu-Chieh Wei of State University of New York at Stony Brook, and mathematician Marius Junge of the University of Illinois. This research is funded by NSF Grant No. PHY-0903865, NASA NIAC Program, and NASA Grant No. NNX13AP35A. It is partially supported by National Science Foundation Grants DMS-1201886, No. PHY 1314748, and No. PHY 1333903. Contact: Siv Schwink, communications coordinator, Department of Physics, 217/300-2201. Paul Kwiat, Department of Physics, University of Illinois at Urbana-Champaign. Image by Precision Graphics, copyright Paul Kwiat, University of Illinois at Urbana-Champaign.